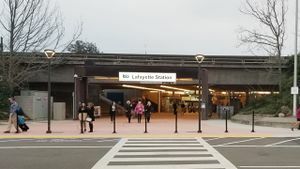 When transferring from BART, you can get a free BART to bus transfer before leaving the paid area. The transfer provides discounted one way fares on County Connection. Parking gets full at the station by 7:00am. Bike racks and 12 electronic BikeLink lockers are available at this station. This page was last edited on 24 February 2019, at 19:14.